Great close up - will have to start hunting bees. Beautiful photo, looks like he's snuggled into a downy bed. He shows up so well against that white flower...great shot! Lovely seeing this and other photos of Bees, there do seem to be a lot more this year. Hopefully the doommongers will be proved wrong this time? though I suppose it's early days yet. ~The govt has just allocated £10 million to look into the problem so lets hope they get going and find an answer sooner rather than later!Something to do with parasite mites? 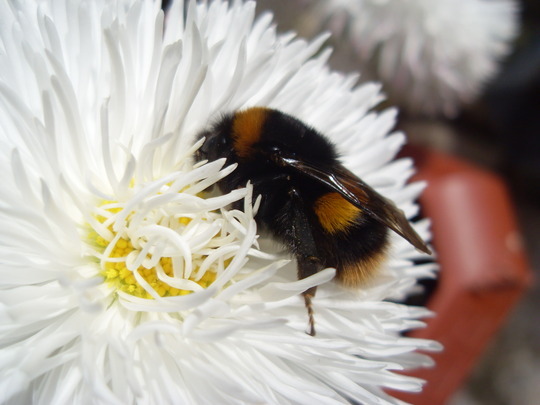 Great photo, love the contrast of the bumblebee & the flower! I must say this is a fabulous photo Irish. may I ask what make of camera you are using, I can't get close ups anywhere near like this on my camera. Tref. its just a compact digital camera, a Samsung P800. Overdosed on pollen, great shot there. I think that you are a professional photographer on the quiet, lol, I love to take close-up's like that stunning picture well done. Sorry got to this late Eileen been a busy bee myself lately ..superb close up you just have to be proud of this shot , its great. You Go Girl ! That's the way to show us how it's supposed to be done. Fantastic shot !